Steve is off at the store securing his fiancé-of-the-year award, picking up poblanos and cilantro for the next stop on Tour de Gratins: battered and baked stuffed chiles. In the meantime, I’d like to embrace the quiet moments without baseball on TV to bring you a legitimate recipe. Not that my last couple posts, filled with seasonal produce and dinner ideas, are invalid because they don’t contain one specific recipe, but being a food blog, I think that you, as my readers, probably expect the majority of my posts to share a recipe and related photos. Or maybe you don’t expect that, and you’ve been enjoying the diverse post topics. I’m not a mind reader, so let me know if you have a preference! My three cheese Spanish potato frittata is a perfect example of the versatility of frittata, and even if you deviate (significantly) from my prescribed fillings, it’s a clear template for the basics of frittata making. It’ll allow you to explore endlessly by packing what is essentially a super thick omelette with any seasonal (or not so seasonal) veggies and herbs you have on hand. 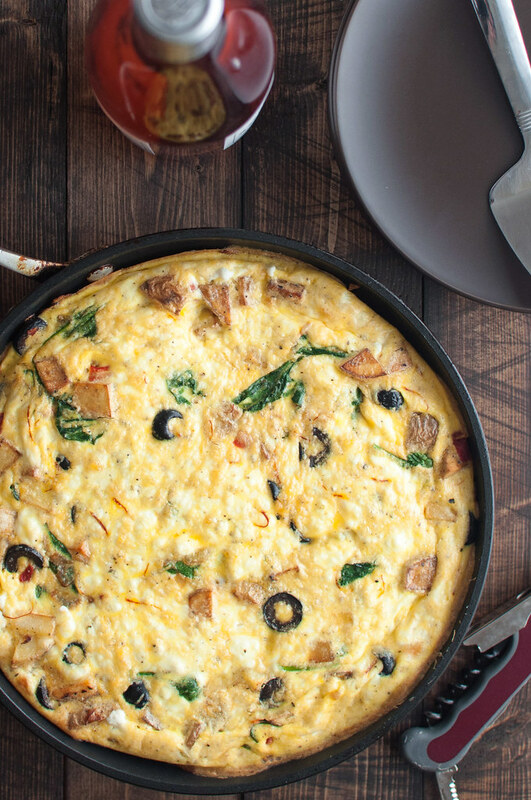 Even if you have only one cheese and one veggie, you can still make an awesome frittata! This Spanish version, after all, was borne of experimentation, throwing together scraps of potato, the sad ends of a few cheeses, half-used jars of peppers and olives, and a tub of spinach on its last legs. This all happened on a rushed Saturday morning (errr, afternoon?) where I was trying to both eat brunch and get out the door for something, so I didn’t even have time to take pics or write down the recipe on the first go. Let’s just say I was not sad at all when I recreated the recipe for photography and documentation purposes. Probably the best part about frittatas (and other egg bake type breakfasts) is how well they keep for days in the fridge or weeks in the freezer. 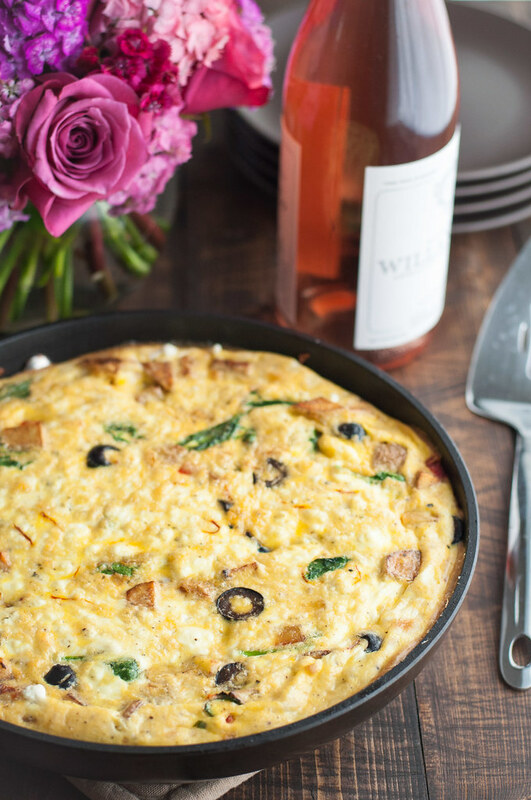 Frittata is how I survived serving both brunch and dinner the first time I hosted Christmas and how I fed friends and family the morning after my engagement party a few weeks ago. Just be careful to reheat at a low temperature to avoid overcooking the eggs, and you’re golden. Now it’s name for an ungraceful segue, since I see not the tiniest conceivable connection between frittata and the movie I watched last night. Frittata = cheesy, delicious, exciting. Interstellar = freaky, mind-blowing…exciting? Okay, so maybe they are kind of similar, but it’s a stretch. People, I am not a movie fanatic nor critic, but did anyone else go out of their mind when watching this movie??? I felt like I was watching a combo of Signs and some space movie, and it reminded me of the reason that I don’t really like movies. Yes, they transport you to magical or scary make believe places, but I also have a really tricky time assimilating back into reality later. Steve promptly began snoring at 1 AM when we hit the sack, but I was so wired contemplating a cylindrical 5-dimensional world full of humans and something I think is called the space-time continuum that I had to read Autobiography of a Yogi for 45 minutes to snap myself out of it and induce exhaustion. Yikes. I guess I won’t be seeing another film until my PTSD from this one subsides. On a more delicious note, I’m off to prep some chiles! P.S. – Happy father’s day to the dads out there! For the more omnivorous dads, I’m sure this frittata would be super tasty, and stick with the Spanish theme, with some chorizo thrown in! P.P.S. 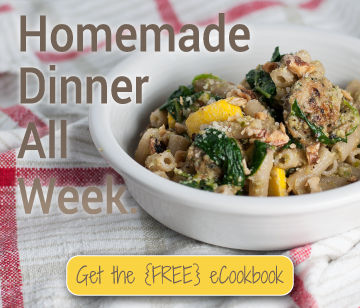 – Check out my new page with tons of ideas for using all your veggies, herbs, and fruits! If you can't find saffron or just don't want to shell out the cash for it, smoked Spanish paprika would also be delicious in this filling, cheesy frittata. In a large (10 inch), oven-safe non-stick or cast iron skillet, heat ½ tablespoon oil over medium. Add half of potatoes, sprinkle with salt and pepper, and toss to coat. Pan fry potatoes for 15 to 20 minutes, stirring occasionally, as you prepare the other ingredients. When potatoes are browned and pierce easily with a fork, remove to a bowl. Repeat process with more oil and remaining potatoes, leaving any extra oil in the pan. Combine saffron with enough of the hottest tap water to cover (about a teaspoon). Allow to hydrate for a minute or two. In a medium bowl, whisk eggs, almond milk, all cheese, a small pinch of salt, a generous sprinkle of pepper, and the saffron mixture (water included) until combined. Set aside. Heat butter and last tablespoon of oil in the skillet over medium high and add onions. Cook until moderately browned, about 5 minutes. Add olives and peppers and cook until heated and any juices are gone. Add greens and cook until wilted, then stir potatoes back in. Reduce heat slightly, season with a little salt and pepper, and distribute veggies evenly in the pan. Pour egg mixture evenly over the veggies and return to medium high heat. 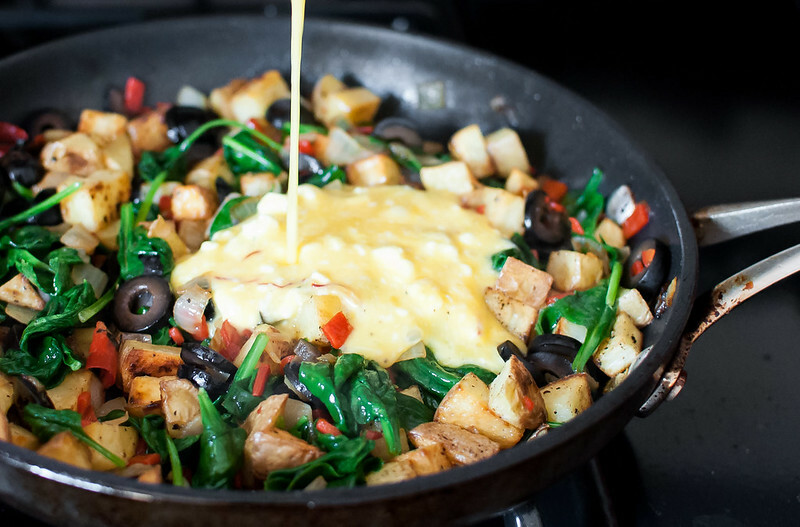 "Jiggle" the pan while cooking for another 45 seconds, to help work the egg mixture down through the veggies. Place skillet just above center position in oven and bake 15 to 20 minutes, until puffed around the edges and nearly set in the middle. Cool in pan for 5 minutes, then use a small, thin spatula to loosen around the edge of the frittata. Tilt the pan about 45 degrees as you use a spatula to help slide the frittata out onto a cutting board or serving plate. Slice with a serrated knife just before serving warm or at room temperature. To reduce prep time by 30 minutes, fry potatoes in advance and refrigerate. Alternatively, the smaller you cut the potatoes, the faster they'll cook. You can also roast the potatoes in a hot oven on a sheet pan with olive oil, salt, and pepper to save time. I've tried both and achieved better golden color on the potatoes using the stovetop method. If you can't find piquillo peppers, substitute roasted red peppers. To substitute smoked Spanish paprika, add the dried spice directly to egg mixture, without hydrating in water. Use about ½ teaspoon, unless you know you love the flavor and want a bit more. To reheat frittata, it's fastest (but not essential) to thaw it first. 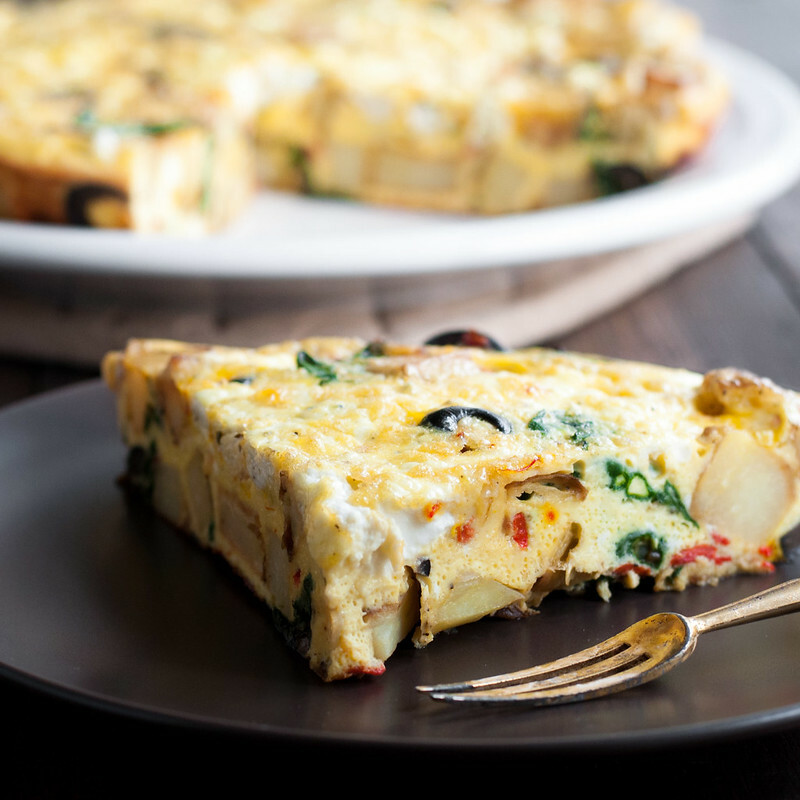 When making the fresh frittata, allow to cool, cut into quarters or smaller, and wrap each piece in foil. Open each piece slightly to vent, place on a baking tray, and heat around 300 degrees (F) until warmed through. To microwave, remove from foil and heat in 45 second intervals at 50% power. Note: This page contains affiliate links. It does NOT contain sponsored content. Affiliate links (to products I recommend, on Amazon) offset my ingredient and website maintenance costs, so I can keep bringing you brunch-y recipes like this one. Thanks!